When you choose a name like UNREAL Mobile for your cell phone company, you already have a lot to live up to. UNREAL Mobile is a new MVNO (mobile virtual network operator) on the market offering some fairly unbeatable pricing packages. But does it really live up to its name? I’ll get to that in a moment, but first I want to talk about how I came to try out and review their service. 1.1 what is UNREAL mobile and what do they offer? 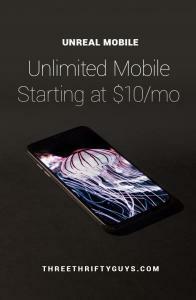 UNREAL Mobile is an all-digital, premium mobile carrier that offers the lowest priced unlimited mobile plans starting at $10/mo that was launched a few month ago. At first I was a little skeptical (as I’m not a fan of over-hyped names / marketing). But, us guys are big fans of the MVNO’s out there (like, Tello, Ting, Tracfone and Twigby) – so we love to checkout any new ones that pop on to the scene. The MVNO market is getting quite packed and the competition to have the best deals are heating up. I currently use Tello for my service and pay $11.34/mo for 300 min, 200 MB and unlimited texts. While MVNO’s are not perfect (if you are out of range of WiFi, or the network they rent from – Sprint is UNREAL Mobile’s provider, your service will suffer. UNREAL Mobile is now also providing GSM service). But the cost-savings for thriftsters is just tough to beat. I’m also fortunate that I’m always around WiFi service, so I rarely use data (saving lots of $$). what is UNREAL mobile and what do they offer? They haven’t been around very long. They’ve already been profiled by some other media outlets out there, like Clark Howard, USA Today and our friend Peter at BibleMoneyMatters.com. And, the reviews are mostly favorable for the service provided. They offer the chance to buy a phone direct from them (mostly a collection of refurbished models), bring-your-own phone (if it is compatible with Sprint or Verizon), or buy a GSM SIM Card Kit and GSM Hotspot from them. Their latest GSM SIM Card offer is free with a one-time activation fee of $0.99 and GSM Netgear Unite Hotspot is free with a one-time activation fee of $9.99 for a limited time! When visiting their website, they don’t allow you to just look up plans or other information – but “guide” you through a simplified check-out process beginning with asking users to enter their zip code and phone numbers, then address. Once complete, you’re guided to select a device or bring your own. If selecting Mobile Phone, you’re guided to select your UNREAL Mobile device. When a phone is selected, then options for plans come into view – beginning with their “unreal” $10 offering for their unlimited* mobile plan. 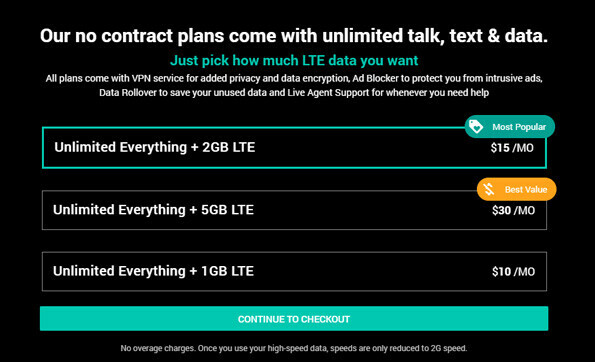 The asterisk is there because you get unlimited text, talk and up to 2GB of data (but who needs more than that—am I right?). I was fortunate to receive a refurbished iPhone 6 to try-out for this review. While the phone was on the low-end for storage, it performed well with the service and was able to text, talk and surf at will (even tried er out after entering the US in North Dakota from a recent trip to Canada). Also, it was an easy start-up after unboxing – which is something I really appreciate. As we’ve said here before when reviewing many of the cell phone providers (and especially MVNOs) – each individual’s needs are so different. So, one has to weigh what they’ll be needing and using their phone for and go from there. But, from my point-of-view, UNREAL Mobile’s offering and UN-beatable pricing certainly lives up to its name. Have you had any experience with UNREAL Mobile or other MVNOs? TTG may earn commission on any products or services purchased via the links on this page – at no cost to you. Thank you for helping to support our site. ONCE NUMBER IS PORTED, YOU CANNOT GET IT BACK! THEY WILL NOT RELEASE IT AND HAVE NO HUMAN CUSTOMER SERVICE EXCEPT SALES WHO HANG UP ON YOU. NO INCOMING OR OUTGOING CALLS. OPENED MULTIPLE TICKETS WITH NO RESPONSE OR SOLUTION. THIS IS AWFUL. BEWARE, DO NOT FALL FOR THIS SCAM!!! This is the worse phone company. Do yourself a favor and stay away. I purchased the service and I’m still waiting after 3 weeks. They said they had shipping issues and they would send the sim via 2 day delivery. It’s been a week now. You can’t talk to anyone but sales and they are rude if you are a current customer. They’ll just send you to automated menu. I can’t talk to anyone. They are only nice before you purchase. In the meantime I’m out of service for 3 weeks now and out $160 12 month of service. Awful company. They should be ashamed of themselves. I hope someone sues them. i don’t understand something about this company,i have a internet plan with unreal mobile which suppose to be unlimited.I buy 5gb of data for 32 dollars a month,which i use up pretty quick,and i have the understanding when all of my high speed is used up,they will throttle you back to 2g.When i start using my computer running in2g,after about 4 to 5 days they will cut me off for excessive usage.I think this is wrong.I am beginning to think this is a sham,to get you to buy more data. STAY AWAY! Ordered a refurbished phone from Unreal. Didn’t work. Tried to exchange. Had no working phone or service for two months. Was still charged for service. After 2 months of trying to resolve the issue I finally gave up and tried to cancel service and request a refund. That took another week and three hours waiting on the phone. Response time was over 5 days for each call or help ticket request. Terrible, terrible, terrible. There are other low cost cell services. Avoid this one at all cost!! Thanks for letting us know about your experience with UNREAL, Nellene. I use an android phone. I hate that unreal app does not show my old text msg from my native msg app. This means I need to switch back to old msg app to view old test msg/history. I called up unreal and asked to escalate they told me to ‘mail’ to their headquarters. I asked to talk to a manager and the rep on the phone told me no manager to talk to. Stay away. I lost 3 months service. The story….I started the trial period but heard from contacts that they had trouble hearing me. I submitted a ticket and started working with tech but service was not fixed at 14 day mark so I had to stop service or buy a MINIMUM 3 month service to continue. The offer I had bought said one month for $10 but that was not offered. So I enrolled and paid for 3 months. Shortly after, the tech said they could not fix my service and despite my phone being compatible, they said get a new phone. Since they could not provide service I asked to discontinue and get a refund…AT LEAST for the extra 2 months they bilked me for. Not allowed they tell me. Of course not, they have my money. Bad company and I have switched to Tello. Try them. I’m testing UNREAL mobile’s GSM option, at the moment. Most of the time I’m on WiFi anyway, so 1GB is enough data for me. Call quality has been fine, although I haven’t performed extensive testing. AT&T service is fairly good where I live, and as stated earlier, I’m usually on WiFi. I would say so far the biggest negative for me is having to use the UNREAL app to make calls and send text messages. It’s not that the app is bad, I would just prefer to use iMessage for my texts and the iPhone’s built-in dialer. I do like how easy it is to review your account with the UNREAL app. At a glance it’s very simple to view your usage. I plan on continuing my testing for another 1-2 months before completely jumping ship from Verizon, but so far I’ve been pleased with the value UNREAL offers. You cannot beat $10 a month for cell service. If UNREAL was to allow me to use my iPhone’s built in dialer and iMessage, it would make my decision that much easier. Love to hear what you think of it after your 2 months of use, Garrett. Thanks for sharing your experience w/ us AKB. Their support is the worst. Inept operators and their help desk, e-mail tech support is clueless. I brought my own phone at first and all went well. Then I had to move my service to a new phone for security reasons. They could never get it right. I called for weeks with hours of hold time. Yes the service is cheap but the support is even cheaper. Sorry to hear your frustrations Cliff. I switched from MetroPCS to Unreal and used the GSM service (ATT network). You have to use their app to make/receive calls and texts which is a huge downside never reported. My understanding is that the GSM service is voip. No one could hear me on phone calls and I canceled two days later. Even worse, Unreal changed my phone number to a land line number and it took over a week to port my number away from them. To add insult to injury, Unreal’s 100% risk free guarantee is a fraud… they only refunded me back less than 1/2 of what I paid. Stay away! Sorry to hear about your experience with them Heath. I didn’t encounter these issues when trying out their service but appreciate your making us all aware of what happened in your trial. It’s been a terrible experience so far! I’ve sent a note to a UNREAL rep and they’ll be in touch. twigby includes 300 minuted for $9. not 200. Thanks for letting us know Fredrick. And for a limited time, it’s actually $6.75 for your first 6 months. My experience with Unreal mobile has been the worst I’ve ever had with any company ever! “Unreal Mobile” is an apt name for this fledgling company. After navigating to their website to determine if my phone was compatible and if they offered service in my area, I decided to switch carriers. What a colossal mistake. First, I was thwarted online from completing this task myself by a technical issue on their website. Next, I called Unreal Mobile to ask that they initiate the activation for my phone and port my telephone number. The representative told me that my current carrier, Tello, needed to release my IMEI number and deactivate my phone. Tello explained to me that my phone isn’t locked, doesn’t need to be deactivated and my IMEI number will automatically be released by the system once a request is made by Unreal Mobile. So, I called back Unreal Mobile, relayed what Tello had told me. They remained insistent that Tello was wrong and the problem was on Tello’s side. The tech support people on Tello’s side were very courteous, professional and competent. They showed a sincere intent to help; So much so, that they even went the extra mile and offered to try to resolve the problem if Unreal mobile would only initiate a 3-way call among all of us. 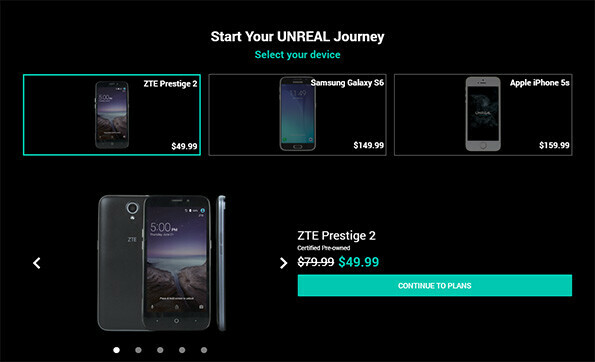 I reached out to Unreal mobile a dozen times and relayed the solution that Tello suggested. Each time as if programmed robots reading from a script, they restated their contention that the problem’s Tello’s fault. On all but two occasions, when I directly asked to speak to a supervisor, their representative either literally ignored me, spoke over me or hung up on me. The other two times, I was promised a call back from a supervisor that never happened. They blatantly lied. Here I am a potential new customer, practically begging them to take my money and they actually hung up on me. More than once! Incredible! It’s ironic that a telephone company won’t spend the money to make a telephone call to add a new customer. One would think a company in its nascent stages looking to grow its base and spread good word of mouth would be more aware and put a better face on its service; Unless they really don’t care…The sad truth is, Unreal Mobile wouldn’t even make a good faith effort to resolve the problem. They absolutely refused to show “any” goodwill. Trying to deal with Unreal Mobile is like spitting into the wind. I can’t speak highly enough about Tello; They’re everything Unreal Mobile isn’t. They were helpful, polite, organized and competent. Tello is a like a finely tuned Ferrari compared to a broken down Unreal Mobile jalopy. Think about it, if this is how they treated a prospective customer, it’s not hard to figure out how they’d treat anyone who’s unlucky and foolish enough to make the switch. I was going to switch carriers strictly for economic reasons. I’m staying with Tello. TRUST ME, learn from my experience, it’s not worth the heartache, time or the energy. This conclusion was reached without even knowing if their service is reliable; By the way, there is no 24 hr/7 day customer support either. It’s definitely worth paying the few extra bucks to stay with Tello. Unreal Mobile is an Unreal Nightmare!!!! We apologize if this was your experience, it is certainly not the norm and we would like to get you back on the right track. We’ve reached out to you privately to gather for more information so we can provide a resolution as soon as possible. I recently decided to give UNREAL Mobile a try. I agree that the pricing structure is simple and a great value. Activation was easy without any issues. On the other hand, porting my number has been an absolute nightmare. I am now on my third day without any service. Customer Service has no answers and no timeframe for resolution. So far, it has definitely been an UNREAL experience!!! Sorry to hear you’re having trouble, Larry! We’ve received your info and will be updating you on the status of your port shortly. Thanks for your review. I have been researching Unreal myself and just wanted to add a couple of additional points. First, Unreal is an off-shoot of FreedomPop and as such may invoke strong feelings among those who have had bad experiences with FreedomPop. Second, Unreal uses a real cell connection to talk (not VOIP like FreedomPop does) and this is a big plus. Third, the GSM option you reference however does use the old Voip for voice and you are required to use the Unreal app to place calls and send texts. For many, this is a deal killer for the GSM version. And lastly, it’s unclear to me if the 10 dollar fee includes taxes or not. Thanks again for highlighting new MVNO’s. Hi Keith, glad to hear you’re overall satisfied with our product! Though our GSM option does not use cellular technology at this time, you can look forward to it being supported in the near future. Currently, taxes on products and services are covered by UNREAL Mobile.